The city with something for everyone. While JIC, Sim and Steffi were visiting Stirling Castle, we too, or we two, were also in the town. It’ll never be a city to me. It’s just a jumped up town with a good curry shop and an interesting art gallery, oh yes, and a Waterstones and a Nero. The rest I can do without quite happily. Glasgow? It’s a city. Embra is a city too, Even Aberdeen is a city covered in granite and seagulls, but Stirling is just a decent sized town. Our reason for visiting today was to have lunch in that good curry shop. A few years ago it was on a downward slope, but it seems to have got its act together again and is now back on the up. New seating and maybe a bit less scruffy interior, but thankfully they decided to keep the menu as it was. Wise people. Scamp’s Veg Pakora followed by Veg Dhansak seemed to satisfy the lady and although my Haggis Pakora was a bit heavy and my Chicken Tikka Chilli Bhuna was a bit too spicy, it was deliciously sweet and full of flavour, so I won’t complain. It seems, like I said, that they are back on track. The foodies said so! Had a look in the Art Gallery and appraised the offerings there. Some were just too twee and rejected out of hand, but a couple of others were in the category or “I’d but that if my lottery ticket came up”. Not having bought a lottery ticket, that purchase was unlikely, but the artist, Julian Mason, really had worked out how to paint wet water. As if I could do anything like that. When we’d parked we couldn’t help but notice the number of Italian motorhomes that seemed to have taken over the carpark. They were still there when we were going home. Scamp thought they were something to do with the European Championships which finish tomorrow. It’s as likely an explanation as any. Not long after we got home, the other three arrived back from Stirling Castle and Doune Castle where Steffi had re-encacted the Quest for the Holy Grail, complete with coconut shells, as so many have done in the past I seem to remember. I drove them all in to Glasgow to meet ’The Boys’, Andy and Chris, with respective wives. We’re not expecting them back until late when old folks like us will be tucked up in bed. On the way back I got some ice cream for Scamp and me from the cafe in Muirhead. Also got some Oddfellows sweeties and a stick of Gin ’n’ Tonic rock which tasted neither of Gin, nor of Tonic. Disappointing. Oddfellows are half finished though! 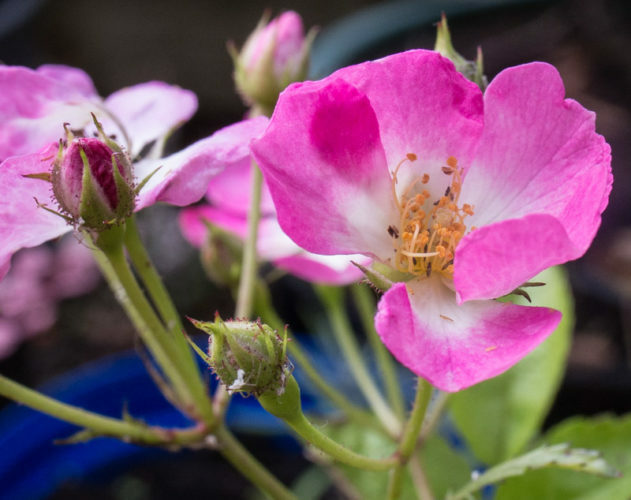 Today’s PoD is Scamp’s little rose bush she has grown from seed. It’s Sunday name is Little Gem, but it’s always been called Rosie and it flowers continuously all summer. It deserves its place as PoD. Tomorrow the visitors may be going to Embra and we may go to Glasgow. It all depends on the weather.